Sales of Ford vehicles that run on compressed natural gas or liquid propane gas have set record levels, perhaps because business and commercial customers are tired of the fluctuating price of gas and are seeking some form of relief. As consumer demand increases for CNG and LPG vehicles, Ford is expanding its offerings in this growing alternative-fuel market segment, with eight trucks and vans. as well as two ready to modify chassis. As gas prices continue to rise, CNG conversion can greatly reduce fleet operating costs. CNG sells for $2.10 per gallon, a significant savings over unleaded fuel, that cost on a national average of $3.78 per gallon, according to the AAA Fuel Gauge Report. Ford aims to provide sustainable solutions for a broad spectrum of its fleet customers and continue its lead the commercial vehicle market . CNG is compressed natural gas, primarily composed of methane. Stored and distributed in rigid tanks capable of pressure from 2,900 to 3,600 psi, most CNG used in the United States is produced domestically. In fact, the US exports CNG, producing more than we currently use. Depending on how its used, some businesses can break even for the outlay on CNG/LPG systems in as little as two to three years. CNG is also cleaner burning and releases fewer particulates and CO2, resulting in up to 30 percent less emissions of the greenhouse gas, according to the US Environmental Protection Agency. Companies with fleets are beginning to make long-term commitments to CNG, such as Indianapolis, where this year’s NTEA Work Truck Show is being held, who is converting official cars, heavy trucks and police cruisers to a mix of electricity and natural gas, The metropolis expects to completely eliminate the use of gas and diesel fuels by 2025. As the best-selling commercial vehicle brand in North America, Ford will offer the Ford Transit range of full-size vans, wagons, cutaways, and chassis cab models powered by a 3.7-liter V6 equipped ready with a CNG/LPG prep kit to aid customers who run vehicles with these more affordable and cleaner fuels. 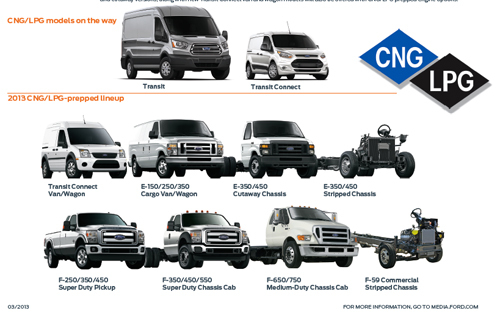 The Ford Transit compliments the Transit Connect van, wagon and taxi lineup; Ford Super Duty pickups; stripped chassis, legendary E-Series vans, wagons and cutaways; and medium-duty F-450, F-550 and F-650 variants with factory-prepped CNG/LPG engine conversions. The next generation Transit Connect will debut later this year with a CNG-ready engine, offering a 2.5-liter four-cylinder that's more responsive and fuel efficient thanks to intake-variable camshaft timing. Each Ford engine that is prepped for CNG/LPG conversion is equipped with hardened valves and valve seats, and Super Duty trucks are equipped with the 6.2-liter V8 featuring a unique bi-fuel intake manifold to accommodate the fuels. CNG/LPG factory engine prep costs only $325 before fuel tanks for which the customer chooses the supplier, Additional fuel lines and unique fuel injectors are also up to the fleet manager. The modifications usually run about $9,500 to $12,500, based on tank capacity. The commercial truck market has many vocations and vehicle requirements. Ford is working with pre-qualified adapters to provide completed vehicles under the Qualified Vehicle Modifier program. Just one more way the only member of the Big Three who didn’t need a government bailout, is leading the pack in alternative fuel vehicles. How long until the Ford F150 has the CNG gas prep from the factory? Currently you have to go aftermarket or to individual Ford dealerships to convert your F 150 to CNG and then you are still missing out on the hardened valves and valve seats. I'm currently driving a Ford E2500 van CNG, which I purchased used from a dealer who sold auctioned off National Grid vehicles. The vehicle is old now, and I' thinking of replacing it when the new Ford Transit is available. Ideally I'd like a bifuel vehicle, which runs on CNG, and gasoline. Would this ever be available, and also would a low mileage used one ever be available. I'm on Long Island, NY.